Before we get started, here’s a fair spoiler alert. You should exit while you have the chance. Okay lets get into it. 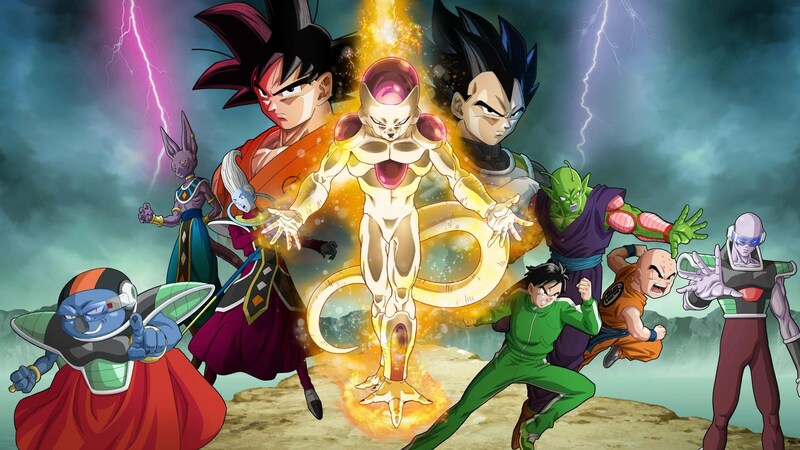 So Resurrection ‘F’ is the 15th Dragon Ball movie so far! The film is an hour and 34 minutes. I get the same vibe from the first movie. It starts of with Vegeta and Goku training with Whis. During the training it shows a glimpse of a new power between Goku and Vegeta. In my opinion, I really like the little part because it shows how strong Goku and Vegeta have become. For example, in the last movie it showed Goku being able to turn Super saiyan God with the help from Gohan, Trunks, Goten, Vegeta, and Videl. Once Freeza is resurrected he’s still mad about the whole thing that happened on Namek and how Goku killed him. So, then what Freeza does is straight train for nine months. It also reminds when Vegeta trained for seven years straight during the Buu saga. Fast forward more and you have Goku and Vegeta face to face with Freeza. Goku and Freeza start fighting but Vegeta then interrupts the fight because he wants a piece of Freeza. Then here comes the best part of the movie when Goku goes Super Saiyan God Blue or Super Saiyan Blue. But Freeza isn’t scared because he to has a trick up his sleeve which is Golden Freeza. Everyone on the battlefield is scared and concerned. That still isn’t the only surprise left. The last surprise is Vegeta also having the power of gods. When I watched the movie live, everyone in the place went crazy and started cheering. It was so unexpected. To sum it all up Freeza was killed yet once again. If you also keep up with Dragon Ball Super you would know that he got resurrected again. But yet again this movie was an absolute banger. If you haven’t seen it go out and watch it. I can’t wait for the new movie in 2018. Parasite That Makes You Love Cats?